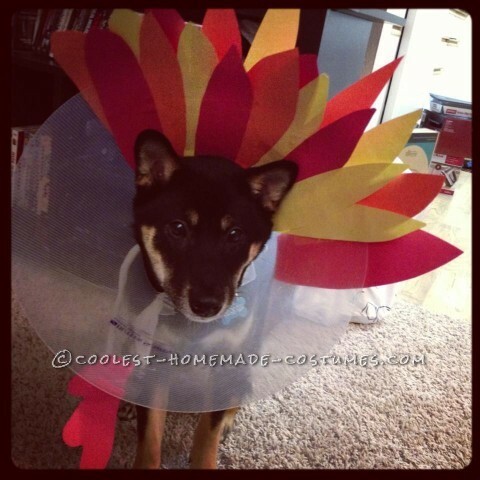 Turkey Dog Costume: Recovering Puppies Can Be Festive Too! My sweet puppy was scheduled to be neutered several days before Thanksgiving. Being a planner, I had his cute little Pilgrim costume ready to go for the big day. Unfortunately, Jax was not nearly as excited for his “man surgery” and had a rough recovery that called for an extra week wearing the dreaded Cone of Shame. There was no way I could bring myself to put the traditional bonnet on my sad, sore puppy, and I figured the effect would be lost under the cumbersome plastic ring he was required to wear. The night before Thanksgiving, with a drugged up little furball laying on my lap, inspiration struck! I couldn’t work around the cone, so I might as well embrace it. I went into my scrapbooking supplies and pulled out several festive colored sheets of construction paper and started snipping away! Before long, I had a pile of feathers that I was able to attach to the cone, both inside and out for a more complete look, with scotch tape. I realized that something was missing, and added a little gobble under Jax’s confused face. The next morning, as I rushed to prepare dinner, the costume showed it’s versatility – not only was Jax kept out of any stray food or scraps that fell by the cone, but anytime I would start to get stressed, I would look down at my little turkey and start laughing. By the time my guests had arrived, Jax had accepted his fate of being stuck in the costume all day, and he was the hit of the party!